According to one tweet, one of the protesters on the roof of the Yahoo bus vomited on the windshield. Anton Molodetskiy, who lives in Oakland, took a picture of the tech bus protest at MacArthur Bart station Wednesday morning. Protesters blocked tech commuter buses at an Oakland BART station, with some climbing on top of buses and at least one activist vomiting on the windshield of a bus for Yahoo employees. The action outside the MacArthur BART stop Wednesday morning followed a Tuesday protest in San Francisco's Mission District. Wednesday's protest took on a funereal tone: A hearse and a man dressed as the grim reaper were on hand as protesters attempted to block buses. According to one tweet, one of the protesters on the roof of the Yahoo bus vomited on the windshield. Other Twitter users tweeted pictures of the protest, showing masked protesters sitting and standing on top of the Yahoo bus right outside the MacArthur Bart station. BART police responded to reports of 20 to 50 protesters blocking buses around 7:39 a.m. and learned that some of them had climbed on top of the buses. Some people who were supporting the protest tweeted using hashtags such as #techbus, #googlebus and #occupyoakland. The group dispersed peacefully as police arrived and there were no arrests, according to BART police. Black-clad masked protesters climbed on top of a commuter bus at one point, according to the "Defend the Bay Area" site, which has announced similar actions throughout the rest of the week. 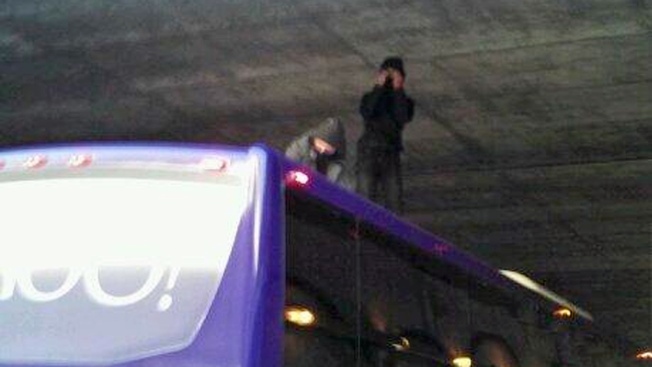 Anton Molodetskiy, who lives in Oakland, tweeted a picture of two protesters on top of a Yahoo bus. Molodetskiy tweeted that two protesters with covered faces clambered on top of the bus with the help of a trash can with no police in sight. Other protesters unfurled banners that said, "Love the Bay, block the bus," and "Capital is the driver, gentrification is the vehicle, techies on the bus." Molodetskiy tweeted that the protesters were holding up a banner in front of the Yahoo bus to block it, "yelling, chanting, laughing, etc." Another protester arrived in a hearse dressed in black robes and with a sign offering commuters a ride, according to protesters. "A hearse arrives. Death holds a cardboard sign that reads 'GBUS TO MTV' and asks techies to get in the new tech shuttle," was how the Defend the Bay site described the action of the protester in black robes. The action is the second this week, following protesters in clown costumes that blocked a Google bus in San Francisco's Mission District on Tuesday morning. The San Francisco Board of Supervisors took up the issue at a meeting Tuesday that went late into the night before they decided to move forward with a pilot program that would charge commuter buses $1 per stop for the use of San Francisco Municipal Railway bus stops. Oakland's city government has yet to take up the issue. Organizers said today's action was part of the "Defend the Bay Area" week of actions scheduled to go through Saturday.